Others have written oodles on how comics work and the mechanics of the comic book medium. Scott McCloud, for example, has several books examining how layout, composition and the space between the panels affect what works, what has been tried, and how to use the "rules" of comics. I'm not going to attempt to add or refute any of that. Considering the recent attacks in Paris at the offices of Charlie Hebdo, however, one has to ask how is it that cartoons can have such an impact? What is it about a cartoon that causes someone to hate so much they end up killing? I can barely comprehend it, but I understand the power of cartoons to focus ideas and emotions. Look at any comic book convention to see how comics and cartoons gather people together to flock among their tribes. For example, I offer my own personal anecdote on how cartoons can bring us together. One Christmas, years ago, I received a copy of "Ten Ever-Lovin' BLue-Eyed Years with Pogo " by Walt Kelly. As a kid, I thought this was the best book ever. "Pogo" which started in newspapers in 1949, relates the antics of Pogo Possum and his friends who live in the Okefenokee Swamp. Characters include Albert Alligator, a turtle named Churchy La Femme, and the self-declared wise Howland Owl. The daily strips have a goofy mix of foreground earnestness often undercut by minor or unnamed swampland folk. Kelly used multi-week story arcs punctuated by daily humor, a storytelling formula which kept readers hooked for years. And best of all, the strip had an edge which made it unpredictable. Often the edge consisted of skewering national political figures, but other times it was a chance to comment on national fads or opinions such as atomic energy, the Communist witch hunts, and even when Armistice Day was renamed to Veteran's Day. I find so many great things in this strip. The line art is amazing - cartoony without slop. So many curved lines: in the characters, the speech balloons, the desk, even down to the panels, it all feels organic. Yet, the lines are spare, not a lot of hatching, no cross-hatching, no grays. The art was designed for appearing on newsprint in a poorly printed daily. The images have been distilled to the most essential, distinctive elements. For example, see how Pogo at the typewriter in the background of the first panel is clearly identifiable. Despite the swamp setting, this is some kind of office. Meanwhile, in the foreground Churchy and Owl carry the action, and the black field of grass makes the foreground pop even more. The dialogue is also engaging. Owl's first balloon: "A cat! Phoo! You calls that news? Everybody must of seed a cat sometime." It's not at all grammatically correct, but it captures a distinctive voice. How does he pronounce "Phoo"? Is is "poo" or more like "foo"? Perhaps Kelly himself doesn't know the answer, but the reader's internal voice knows what someone like Owl would say when his reporter has a cat story, and it is "Phoo!" Of course Churchy has something more than a cat story, but there's a fact-checking problem. Churchy explains, and then challenges. Owl, the self-proclaimed brains of Okefenokee, doesn't want to admit his ignorance, and after a perfectly timed awkward pause decides to run the cat story. Is Kelly commenting on the superficiality of the news, deciding to go with the easy story rather than pushing the comfort zone? Or is it just a funny animal story? "Can you spell armadillo, chief?" The best part of this strip is that there's something funny in every panel, and some panels have multiple funny bits. In panel one I find the following funny: Owl's dialogue, the sign that says "Noose Desk" (news desk), the "Gloo + Ink" pot, Churchy's snappy reporter outfit, and the fact that I can read the entire news items on the page ("my pa saw a cat las yr"). The humor is strong through final panel: we have not only the punch line and the frog child in the wastebasket, but check out Churchy's expression - he considers it "another job well done". I can't tell from Pogo's expression whether he's going to question the story or not. He looks like he'd going to question it, but knowing Pogo's a pretty easy-going 'possum so he might accept it at face value. Now, when I'm in a situation where people are avoiding the central topic because it's a hard question, I think "My daddy saw a cat last year." The magic of a cartoon is that it is an effective method of communication. It uses at least two modes -- graphics and text -- to share an idea between the author and the reader. As a reader, my brain can't not read the words, but the images support the story, filling in any information not contained in the dialogue. Together they are a one-two punch straight to the brain. Effective cartoons use images and text in a complementary way, but also distill them to the essence. Ivan Brunetti's "Cartooning" spends pages discussing how to refine drawings until every line is absolutely necessary. Before cartooning, Walt Kelly worked as both a journalist and as an animator and storyboard artist for Disney. Journalists have to learn how to write concise stories that still convey all the information. At Disney, studios artists had plenty of practice drawing but also learned how to capture the personality of a character in the sketch. This comic strip is not an owl, a turtle and a possum. It is a set of lines on paper, but through his artistry Kelly has given them life and set them in a milieu that exists for us, the readers. Years later my own son was looking for something entertaining to read and I gave him my copy of "Ten Ever-Lovin' BLue-Eyed Years with Pogo ." He loved it as much as I did, reading it multiple times. One day we read the cat strip together and we both laughed. But then something interesting happened. Much later, we were having a family discussion and we came to some hard topic. I said, "My daddy saw a cat last year." My wife, who may or may not have read Pogo, was baffled. But my son understood the reference immediately, and the humor from the strip spilled into the discussion and gave us some perspective. This is also the magic of comics: The one-two punch stays in the brain, and even when only part of the work is referred to, the rest comes along for the ride. So, from the genius of Walt Kelly, I not only receive his vision, but get to share it with others, and in sharing it becomes a common point of reference in our lives. Much like Brady Bunch was to a generation of kids, or like Caddyshack is with my college pals, or The Simpsons, Star Trek, and Wonder Woman are to millions of fans. "a director's film reflects the director's personal creative vision, as if they were the primary 'auteur' (the French word for 'author'). In spite of—and sometimes even because of—the production of the film as part of an industrial process, the auteur's creative voice is distinct enough to shine through studio interference and the collective process." In comics, the production process is small enough that one or two or a few creators can work together to ensure the artist vision. So, this is the magic of cartoons: a cartoonist can create a world using only a few pen strokes and this world is transmitted directly into our brains using both language and imagery. It's a direct feed to the brain, and that's why it inspires both so much love and hate. Cartoons are a medium, and used effectively that medium can bring people together, or divide them; cause them to question the establishment, follow a religion, or brush their teeth. It's a powerful magic. Remember that next time someone says they saw a cat last year. The attack on Charlie Hebdo is a coward's act. Using guns and violence to silence voices who are seeking to explore and enlighten the world is the result of someone who fears their own reality. The result of someone who can't reconcile their thoughts with the world around them. Unfortunately, people use religion and weapons as a way to justify their actions. The details of the attack are unclear. This is known: three masked gunmen attacked the Paris offices of Charlie Hebdo, a satirical magazine similar to early Mad magazine or the National Lampoon. The result, twelve people dead, many more in mourning. The magazine's site now has a black page that says "Je Suis Charlie" ("I am Charlie"). If you click on the link for the pdf, you will see the same phrase in Arabic, German, Spanish, and other languages. I recently wrote a blog post about the evolution of comics in France. 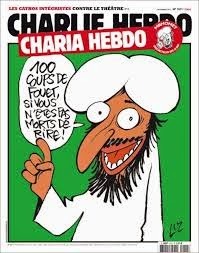 Despite its age, Charlie Hebdo is still admittedly edgy A 2011 issue was renamed "Charia Hebdo," guest-edited by Mohammed. So, I was surprised to hear it mentioned on the morning radio news. Then saddened. Then devastated. We are all Charlie. Art makes a difference. Look at the world for enlightenment.